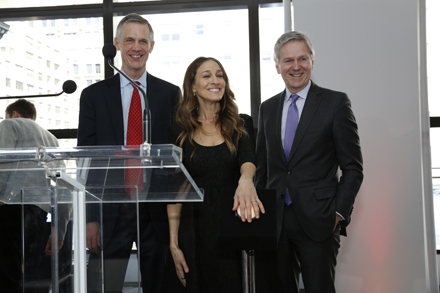 Sarah Jessica Parker with President Van Zandt and Board of Trustees Chair Joseph R. Gromek at the opening of the University Center. Photo by Michael DeVito. For the first time in almost 80 years, The New School once again has a central hub to house all its students—whether they study anthropology or fashion, dramatic arts or community development. The university unveiled its #NewUniversityCenter last week amid fanfare including inspiring student performances, reminiscing alumni, and an open house welcoming the entire community. Here’s a quick rundown of the highlights. There were celebrities and designers. Sarah Jessica Parker kicked off the opening events Thursday morning, enthusiastically declaring, “The University Center is a gift to the Village.” Parker—whose name is synonymous with New York City—wore an A-line black dress designed by Tracy Reese, an alumna of Parsons The New School for Design. Reese herself spoke later that day, remarking on the building’s potential for fostering greater community than ever before. There was a birthday. Standing next to President David E. Van Zandt, John L. Tishman (a lifelong New School advocate and philanthropist whose company led the construction of the University Center) blew out candles on the eve of his 88th birthday at a celebratory lunch in the building. There were politicians. Longtime New York Senator Charles Schumer fondly remembered past public programs offered at the university and noted its integral role in shaping Greenwich Village. Newly elected Manhattan Borough President Gale Brewer gave an impassioned speech on the social awareness and innovative spirit of New School students. There were friends and neighbors. People mingled and explored the first seven floors of the University Center on Saturday, when the building formally opened to the public. Jazz students and performers played throughout the building as students led tours and visitors admired the modern design. But perhaps best of all, there was the collective feeling of accomplishment with the culmination of nine years of work. Welcome to the University Center. Click through the slideshow below for a glimpse of last week’s opening events.